Want to design your own video games? Let expert Scott Rogersshow you how! 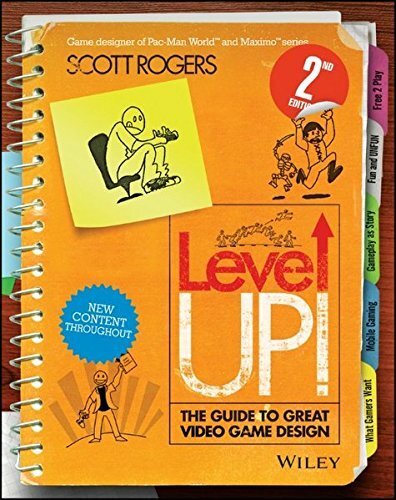 If you want to design and build cutting-edge video games butaren’t sure where to start, then the SECOND EDITION of theacclaimed Level Up! is for you! Written by leading videogame expert Scott Rogers, who has designed the hits Pac ManWorld, Maximo and SpongeBob Squarepants, thisupdated edition provides clear and well-thought out examples thatforgo theoretical gobbledygook with charmingly illustrated conceptsand solutions based on years of professional experience. Level Up! 2nd Edition is includes all-new content, anintroduction by David “God of War” Jaffe andeven a brand-new chili recipe –making it an even moreindispensable guide for video game designers both “in thefield” and the classroom. Grab your copy of Level Up! 2nd Edition andlet’s make a game!